Since I started photographing in 1994, I´ve explored what lies within Man and that which is innately difficult to grasp. Man´s identity never ceases to fascinate me. My artwork is reflected through an internal process conveyed in an external expression through photography and film. I often invite the viewer to explore his own thoughts on some of the surviving taboos of our time. The projects are an exploration of topics including old age, death and sexual identity, where I find Mans longing for something larger than him/herself to be a recurring theme. At the moment I am working on two independent projects simultaneously. `Moksha (2007-2012) in India and `Okurimono` in Japan (2007-2012). `Okurimono` is defined as `that which is in-between`, and encompasses a project which has evolved through five trips to Japan from 2007 to 2010. The images revolve around dreams, vulnerability, darkness and brutal truths. In these four years of work I have gone further and further beyond my own comfort zone in search of truths which may cause unease for some people. 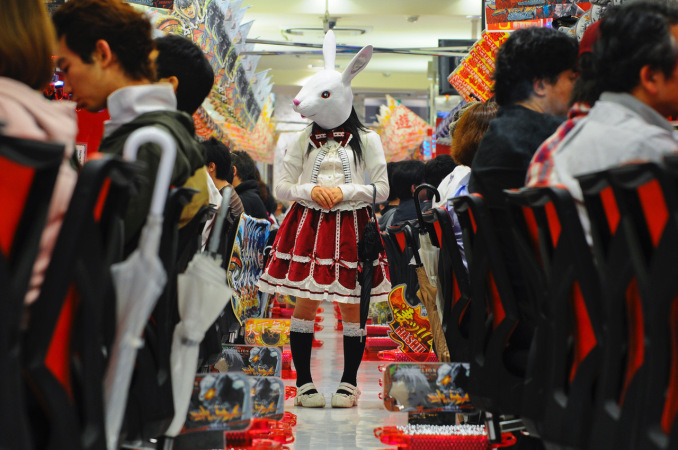 The first part of the project focuses on Japanese sub-culture, the Harajuku and their own search for a unique expression. Where dissonance between object and Man, in architecture and nature, is a recurring theme. In the second part of the project I explore various expressions of sexual identity. Our digital society is drained of wonderment and any sense of the mysticism. Many aspire this in their day to day lives. The `okamas`-the transsexual `new halves` of Tokyo´s underground live out their complex truths in ritualized isolation. Many might see this as a threat to conventional gender categorizations, which substantiates the basis of our society. Reality and dreams; the ritualistic and play blend, in which the frail parameters between the known and the unknown dissolve. The film gives the project an extra dimension for the senses, where experimental and ritual inspired settings reveal truths between pleasure and discomfort.